In a future Canada, a pack of robot “horses” search for work, dignity and respect. A musical about freelancers, company work and a handsome new Governor. 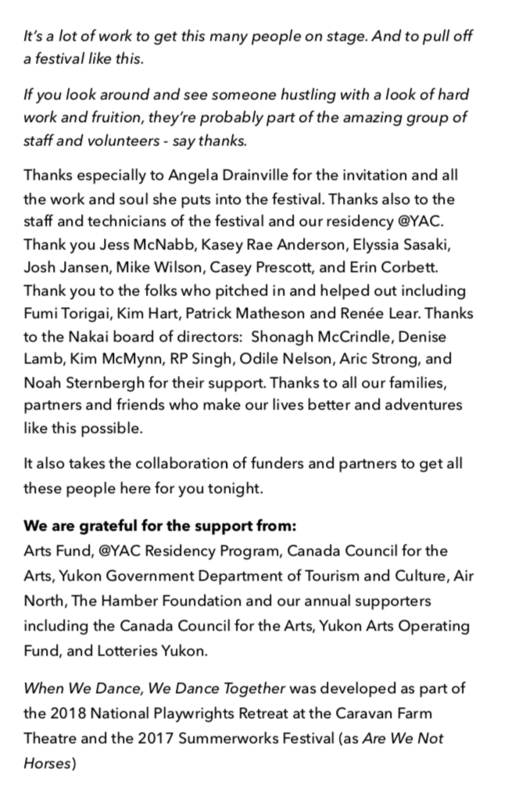 Arts Fund, @YAC Residency Program, Canada Council for the Arts, Yukon Government Department of Tourism and Culture, Air North, The Hamber Foundation and our annual supporters including the Canada Council for the Arts, Yukon Arts Operating Fund, and Lotteries Yukon. Originally created in 2017 as a Nakai Theatre & Small Wooden Shoe project. Thanks to the support of Summerworks, Canada Council for the Arts and the Toronto Arts Council for supporting the creation process, travel and presentation. Rock Plaza Central is Chris Eaton, Scott Maynard, Rob Carson, Andrew Innanen, Donald Murray, Fiona Stewart, Louis Apicello.